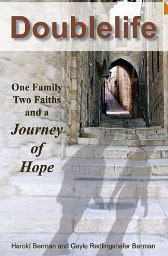 Doublelife: One Family Two Faiths and a Journey of Hope, by Harold Berman and Gayle Redlingshafer Berman, is a book that is inspiring and paints a vivid portrait of the religious journeys the authors took within their interfaith marriage. From the moment they met, Harold and Gayle knew they were meant for each other despite their different religious outlooks. Harold was a secular Jew, Gayle was Christian. They did not let that deter them in their relationship. Once they decided to marry, their plans included a ceremony that would include aspects of both religions. Their story is told through letters written to each other, letters that include the year leading up to their marriage. The letters written in that first year are filled with questions, hesitations, apprehensions regarding religion and religious life, and emotions that ebb and flow. Their letters are infused with their thoughts, blending logic and emotion, yet, always trying to come to a resolution that is shared. For Gayle, Christmas was a big issue. For Harold it meant nothing in the realm of religion or Christmas trees. For Gayle, whose music career was important, church attendance was primary in her life. For Harold, renewing his Judaism and attending a synagogue was becoming a primary factor. They had both decided that they would attend a local synagogue. Gayle did not want Harold to feel excluded from Judaism, and also wanted to learn more about the service and celebrations. From there, Jewish ideals took root in Harold, and the reader can see him change from one written correspondence to the next. He was beginning to ask questions, ponder issues, and he became involved in Jewish practice from baby steps to large strides. The building blocks were in force, and each step cemented his beliefs and caused him to seek more knowledge. He set a religious foundation for himself. Gayle followed along. And, with that act of following, we see her grow and come into her own regarding Judaism. She fasts on the first Yom KIppur that they share. A small step for some, a large step for her. She becomes knowledgeable on various Jewish holidays, and the more she learns the more she wants to educate herself. She slowly evolves, and at one point even questions how she can be involved in a church music program when her Christianity beliefs are beginning to fade. In the beginning of their marriage, they did not want children. That eventually changed, and it was Harold who initiated that change. Once they decided to have a child, they knew that an interfaith religious background would not suit them. Gayle was receptive and supportive of that concept. I enjoyed Gayle’s transition over the years. And, more so, once she and Harold adopted their first child. They had decided that their son would be raised Jewish. They both felt that one religion should be a dominating factor, and that two religions might be confusing to him. From that moment on, the change in Gayle was dramatic. Her searches lead her to question more. They also bring her discomfort with herself, as she flounders within a religious realm, not realizing who she is or what she is. Harold also transitions, and Orthodox Judaism becomes his choice, and within that choice, discussed with Gayle, their child will be raised as such. Doublelife is a story that shows the determination of two people to accept each other’s religious backgrounds, and work towards an understanding that will blend their views together. And, through that acceptance, they remained in constant communication with each other regarding their fears. Communication was the cement that bound them together. There is so much to glean from reading Doublelife: One Family Two Faiths and a Journey of Hope. It is a story whose journey has religious depth and meaning, and has multitudes of questioning on Judaism. The reader can learn a lot from this family, who began their married life as an interfaith couple. The trials of keeping a Jewish home, especially for Gayle, shows the religious force depicted in great detail. Her spiritual outlook became defined in ways she could not have imagined. The story unfolded, and this reader was swept away by the frankness, and the sense of love that sparked two individuals to change, not only for themselves, but for each other and those around them. I highly recommend Doublelife: One Family Two Faiths and a Journey of Hope. There are lessons within the pages that everyone can find meaning in. It is not simply a story regarding Judaism. There are many more aspects to it that will appeal to everyone. From acceptance and understanding to hope and inspiration, the messages are ones we can all learn from and appreciate. 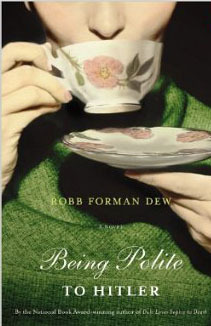 In the book, Being Polite to Hitler-A Novel, by Robb Forman Dew, the title can be initially misleading, because the book has nothing to do with Hitler, and everything to do with the societal standards and mores of time. From 1953 on, Agnes, the main character, follows etiquette’s insistence on politeness, even during moments where circumstances are less than ideal or less than positive. In her mind, politeness is a standard to be idealed, and even if Hitler was standing in front of her she would exhibit politeness, despite her feelings. The characters in the book are floundering within the realm, of family dynamics and communications. Their often political discussions are ones that leave much to be desired, and it seems as if they are speaking to hear themselves talk. They are flat, and their personalities are not ones that are necessarily desired. The reader sees what the individuals are thinking, through their mind’s view of what is occurring or not occurring, especially through Agnes’ eyes. She is reflective of her past. Yet, often times what is not occurring is actually more demonstrative of feelings than if words were uttered. From the various major developments within a twenty plus span of years, Agnes seems untouched by the occurrences, such as Sputnik, the John F. Kennedy assassination, desegregation, and so much more. It is easier to allow the mind to dismiss or not dwell on the situations, and go on with life without blemishes of historical consequence. History is quite evident, within the pages, yet when Agnes and her family and friends are confronted with news or the latest incidents, they seem to avoid acknowledging them. I found Being Polite to Hitler to be a less than interesting read. It is not really my type of story, but I am sure others will enjoy it. The setting and details regarding clothes, living habits, monetary influences, etc. are depicted quite well. The descriptions and portrayals of lackluster individuals caught in the stream of daily life, trying to out voice each other is very pronounced and well written. With that said, I still did not enjoy the story line of Being Polite to Hitler. I am glad it was a library book, and not one I bought. 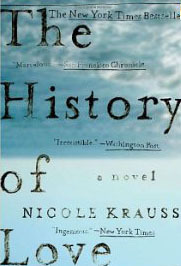 The History of Love, by Nicole Krauss, is a novel with a unique viewpoint, meshing lives and loves in a story within a story. Krauss has done an excellent job of infusing the pages with several stories, within the whole. We have Leo Gursky, a man who is aged and dying, and terrified of dying alone, without anyone knowing. He is obsessed with that fear, and goes out of his way to bring attention to himself, each day, incidents such as dropping change all over the floor of the market. Leo’s story is the most intense, in my opinion, because of his past history as a Holocaust survivor, surviving in the forests, and also due to the loss of his youthful, first love, Alma. He was able to survive by continually dreaming of Alma. When it came to her, his will was extremely strong. He is left to survive the loss of his family, who all died during the Holocaust. Leo Gursky fell in love as a young boy, with a girl named Alma. Alma eventually leaves for America, and Leo is left behind, to suffer the pain of the loss of that love, also. Gursky eventually comes to America. His fears are still intact. He is a locksmith by trade, unlocking doors for others, but not able to unlock his own haunted past. It is as if he is frozen in time. He dreams of Alma, his lost love, to get him through life. His one staunch friend, through all of this, is Bruno, a childhood friend, who seemingly lives upstairs from Gursky. Gursky has a very intense and vivid imagination, one that can get him through painful circumstances. His imagination helps him survive loneliness, helps him in writing a book called The History of Love, which he then entrusts to a good friend, to hold, until the friend sees him again. Therein lies the beginning of a journey, the journey of the book, into the hands of others. It ends up causing curiosity, to one young girl, named Alma (named by her parents after the Alma in Gursky’s book), in the present day…and she begins a search, for the author, which in reality is a catharsis for her to help her deal with the loss of her father, who has recently died. I recommend The History of Love. It is intense on so many levels, and Nicole Krauss manages to deliver the final punch, with brilliance. What My Mother Gave Me, by Elizabeth Benedict, is a book of collected stories from thirty-one women. Each story is inspiring in its own way, and holds a wealth of insight into what we hold dear and precious, and what we consider as a gift given to us by our mother. Gifts do not have to be tangible or physical items, they can be gifts of acceptance or recognition, gifts that touch us in ways that only the intangible can. From verbal gifts, a gift of sobriety from a mother, a boat ride, the warmth of a quilt, the power of independence, and so much more, the stories are examples of mother and daughter relationships. We often define ourselves through our interactions with our mother. Whether we agree, disagree, have rough moments or joyous ones, at times there are those moments of recognition that enable us to move forward knowing there is a gift we can hold dear in our hearts. Whether it be a physical gift a memory or words of encouragement, that gift is valuable and precious to us, and helps cement our mother-daughter relationship. Some gifts transcend time, some teach us about the world, and other gifts last a short amount of time, but the memories linger on. They help us to find a sense of self within the ongoing societal demands. They bring direction to our lives. 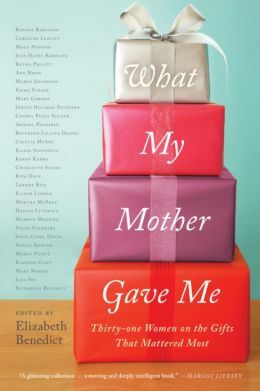 The women whose stories appear in What My Mother Gave Me: Thirty-one Women on the Gifts That Mattered Most, deliver a deep-range of emotion and thoughtfulness in their writing. The stories illuminate their relationships, and foster what matters most to them within the confines of their interactions with their mothers. I highly recommend this book to everyone, it is not only inspiring, but also a lovely study on the mother-daughter relationship. It is a book filled with humor, poignancy and love. There is a story within the pages for every daughter and every mother. Have you ever wondered how “Tekhelet” is created, or where it originated? Do you know the meaning of Tekhelet? Baruch Sterman, with Judy Taubes Sterman, have brilliantly written about “Tekhelet”, or Tyrian Blue in their book, The Rarest Blue: The Remarkable Story of an Ancient Color Lost to History and Rediscovered. The story takes the reader on a journey, not only through time, but through thousands of miles, literally trekkiing to find sources of a particular snail, the murex snails. These snails are the foundation for the dyeing process that produces the particular Tyrian Blue color. Think about it, where in nature do you normally find a blue color? The sky, certain seas or lakes take on a blue tone, and even a few flowers have blue tones to them, but it is not normally found in nature, never mind the particular Tyrian Blue used in Tekhelet. It was also used in the High Priest garments and in the Tabernacle’s tapestries, and a few other items. Blue, surprisingly, is not normally a color found in nature’s environments. I enjoyed reading about the adventure that was undertaken in order to find the murex snails and in order to find documentation of the dyeing process. It was fascinating to read. It was also inspiring on several levels. For me, it was especially intriguing and inspiring concerning the precious Tzitzit threads, the knotted fringes that are attached to the corners of the Tallit/Jewish prayer shawl, and how Tekhelet, the biblical blue dye, is created and used in the shawls. The authors are brilliant in their descriptions, and the word-paintings within the pages are masterfully depicted. Other than the scientific and the technical inclusions, I found the pages infused with beautiful prose, almost poetic at times. The scientific blends perfectly with the religious within the story line and the historical factors. Torah and science coexist on this adventure through time and place. The biblical references that were mentioned reinforced the ancient use of Tekhelet, but also conveyed the deep-rooted Jewish tradition of using the color that was considered to be sacred. I thoroughly enjoyed reading The Rarest Blue: The Remarkable Discovery of an Ancient Color Lost to History and Rediscovered. I learned so much about Tekhelet, and the historical factors that went into producing it centuries and centuries ago. I will look at my Tallit with more profoundness, and will never take Tyran Blue for granted. Bravo to Baruch Sterman and Judy Taubes Sterman for their extreme endeavors and devotion to uncover the mystery of the ancient knowledge of Tekhelet. Life is good when one has a book/s to read. And Sons, the novel by David Gilbert, opens at the funeral of one Charles Henry Topping. Within the walls of the church, A.N. Dyer, Charles’ best friend from childhood, awaits the fact that he is going to deliver a eulogy. This contributes to his reflecting back on his own life, and to the fact that he has been neglectful in many areas, especially with his three sons. The story line can feel disconnected at times due to the fact that the narrator is the son of Topping. Topping’s son is the one revealing Dyer’s life. This in itself makes for a unique situation. Set in New York City, with the upper echelons at a point of disconnect, the story is a one week trip through time, through memories and through explosive moments, as told by Phillip Topping. His narration regarding Dyer and Dyer’s family highlights the fascination the Toppings have for Dyer. Dyer is an author of wide renown and popularity. His is considered an icon, a legend in his time. And Sons is filled with familial forces that border on emotional disregard, through neglect and lack of fatherly demonstration of love. It is a book that is both humorous and sad, and one that can leave you laughing one minute, and angry the next. David Gilbert is masterful with word imagery and with evoking the characters with their thoughts and feelings, as though he is inside their heads. 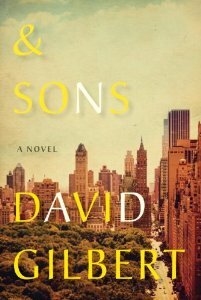 On a scale of 1-5, with five being the best, I rate And Sons: A Novel, 3.5 stars. The best part, for me, were the last 150 pages.